From one of the 365 beautifully appointed bedrooms combined with, Traders, an 18th century sailing barque resting in one of London's only dry docks, it is easy to forget that you are only minutes away from the City of London. 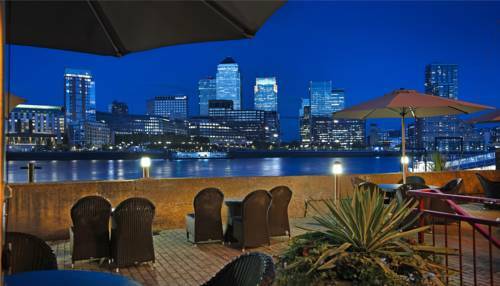 The Terrace Restaurant is unique in its position, adjacent to the Thames River and facing Canary Wharf. The traditional feel has been well received by our customers and guests alike, it is an ideal opportunity to observe the river boats and cruise liners sail up and down the Thames, while enjoying the fresh array of meats, fish and salads. Vegetarian options are available daily, the chefs are always willing to help and with a sumptuous arrangement of desserts and a good choice of continental cheeses, this is the perfect location for a relaxing meal. The Terrace Lounge has a contemporary but cosy decor with the benefit of inspiring river views and direct access to the open air riverside terrace. The riverside Terrace is a fascinating place to enjoy the sights and sounds of the river, while dining or drinking al fresco. Internet - WiFi is available in public areas and is free of charge. WiFi is available in the hotel rooms and charges are applicable. You may check in from 15:00 hours onwards. A courtesy shuttle bus service is provided for all hotel guests. The courtesy bus operates seven days a week at 15 minute intervals, between the hotel and Canada Water bus and underground station. MON-FRI: 0700-2330, SAT: 0800-2330 and SUN: 0800-2300. The hotel provides complimentary car parking facilities for up to 100 cars. A large forecourt in the hotel provides easy access for the picking up and dropping off of hotel guests.